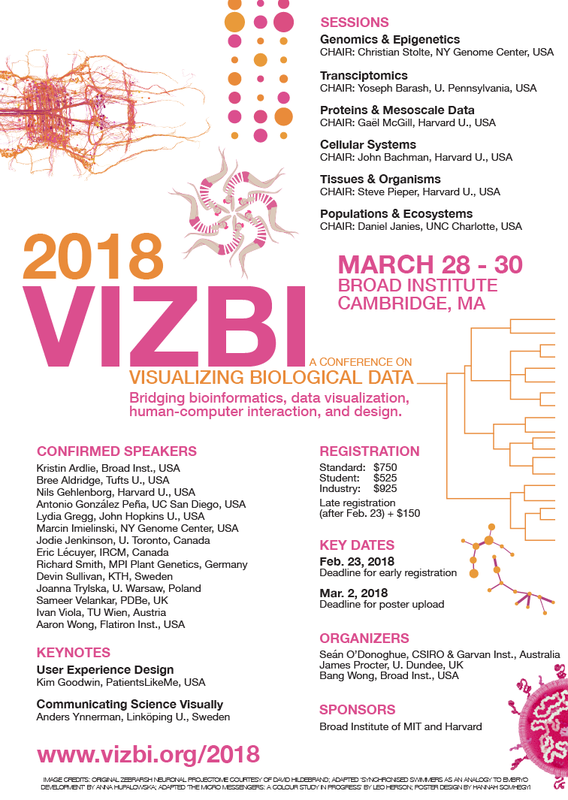 VIZBI 2018, the 9th international meeting on ‘Visualizing Biological Data’, will take place March 28-30 at the Broad Institute of MIT & Harvard in Cambridge MA. VIZBI 2018 features keynotes from Kim Goodwin, Drew Berry, and Anders Ynnerman, as well as talks from 18 world-leading researchers showcasing visualizations transforming how life scientists view data, and driving key advances in molecular biology, systems biology, biomedical science, and ecology. The meeting aims to advance data visualization in the life sciences and brings together a diverse community, including bioinformaticians, data scientists, computer scientists, and experimentalists, as well as medical illustrators, graphic designers, and graphic artists. All participants have the opportunity to present a poster and a lightning talk describing their work. Note that this year we are not able to offer a virtual participation option. Data Visualization Masterclass. One day prior to the meeting (March 27), there will also be full-day training event teaching general principles and practices for turning data into insightful visualisations. Further details will be announced shortly. This entry was posted on Sunday, January 7th, 2018 at 17:12.